Azure Power, which is one of the leading solar companies in India, has bagged in another order for 20 MW of solar rooftop project from the Indian Railways. With this additional win, Azure Power has now become the undisputed supplier of solar power to the Indian Railways with a cumulative awarded capacity of over 66 MW. This prestigious order entitles Azure Power to place Azure Roof Power on railway rooftops across 17 states and union territories. Azure Roof Power claims to have one of the largest rooftop portfolios in the country, with solutions for commercial, industrial, government, and institutional Indian customers. Depending upon the location, the power will be sold at a tariff of INR 3.64-4.49. “We are pleased to expand our Azure Roof Power platform with Indian Railways,” said Inderpreet Wadhwa, founder, chairman and chief executive officer, Azure Power. Azure Power is expanding at an exponential rate in India with a solid portfolio of solar assets and a growing project pipeline. It was also the first Indian solar company to list on foreign stock exchange. The company is also involved in rural electrification, as a constructor and operator of micro-grid in villages. Solar power is catching fire on the Indian transport system. 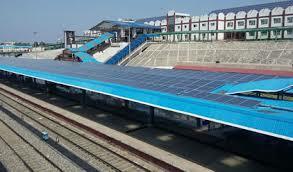 Apart from using panels on the rooftops of railway stations, the government of India also has plans of running solar trains very soon in the country. With the continuous fall in solar prices and an improvement in technology, several emerging economies especially India have fallen upon solar energy to satisfy their ever growing demand for power. It is a good time for solar companies like Azure Power to take advantage of this scenario in India. Power cost is one of the main components of several products and services in India. If these companies can find out a way to further reduce this power cost by using advanced solar technologies, it will be a great relief not only for the Indian Public exchequer but also to the masses at large.